I was supposed to leave at 11:30PM Monday night to make sure I had enough time to finish the ride before Josiah’s baseball game at 7PM Tuesday night. But I goofed up setting my alarm and thankfully was able to wake myself up by 12:15AM on my own without an alarm. This put me riding out beyond Bessemer on roads I’d never ridden before at 2AM. There was no traffic, but you could tell the roads had a lot of truck traffic based on the size of the potholes. I realized that my current light setup is great on roads that I know like the back of my hand, but not so great on entirely new roads. I was totally shocked by the Bankead Lock and Dam. You could ride right up to the foot of the lock and it was overwhelmingly large. I can only imagine what it must be like as they are letting water out to let a boat pass. See the instagram pic below – the dam is in the background and the lock portion is the tall structure on the right. As day dawned, I made my way south and activity was starting to pick up at the strip mines and there were numerous large trucks but fortunately almost all of them were going the opposite way as me. By the time I made it down to AL-219, traffic was getting busy and I got ran off the road for the first time when a car was approaching at the exact moment that three large gravel trucks were barreling towards me at 50+mph. I opted to bail off into the grass knowing that the trucks would not bother to slow down and pass me within inches of my life. Bama Rock Garden Rd was awesome after having to put up with crappy roads and trucks for tens of miles. It was mostly deserted and beautifully paved rolling hills all the way down to US-11 where I made my way over to the Mercedes Plant. I still remember when the plant was first built years and years ago. I raced a train leaving the plant and just beat it to the Co Rd 9 crossing, which was great because the train wasn’t moving very fast and gave me 10 minutes of completely deserted roads to enjoy before getting passed by a herd of cars. 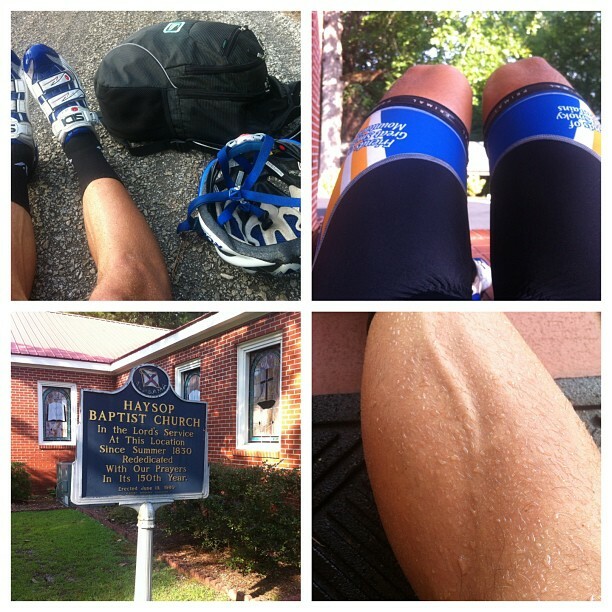 I took Co Rd 9 south all the way to Haysop Church Rd and the 185 year old church. I forgot how nice the dirt road was and really enjoyed riding it this time since I wasn’t severely dehydrated. Shortly after making the turn onto AL-5, I ran across the Heiberger Store where the owner was super nice and let me wash out my camelbak with detergent in case there were any protozoans swimming around in that faucet from the church which looked like it hadn’t been used in a while. I loaded up with a bunch of stuff ($13 worth) and he tossed in a couple bananas for free that he had brought from home. He cautioned me to be careful going through Selma as someone had been killed there just the other day. I was running late to make it back home for the baseball game so I thought I would take AL-5 straight down to Marion to save a few miles, but got ran off the road by a flatbed truck … this time there was absolutely no traffic coming, and the driver decided to pass me in my lane maybe a couple feet away going 60+mph. Based on the approaching road, I bailed into the grass to the right and continued riding but decided to take the very first alternative road I could find. This worked out well because I ended up on Nine Mile Rd, which is an amazing hard packed dirt road with no washboard and much better and faster than most of the paved roads I had been riding (see pic). Marion has its own history for both me and my university (Samford University) as this is the location where Samford was originally located before moving to East Lake and then eventually to its current location in Homewood. Samford sponsors a century ride in Marion, which I rode in 2005 and 2006 before my racing schedule got too busy to ride it any more. Just outside of Marion is Sprott, Alabama where the state time trial was held a few years ago and I broke 1 hour on a 40km time trial for the first time. On this ride, I had an awesome tailwind and rode it all the way to Selma averaging close to 23 mph for a nice 28 mile stretch of road. Selma was interesting although by this point in the ride I was very much in my “let’s get it done” mode and focused more on making all the lights and finding my way across the Edmund Pettus Bridge over the Alabama River and back through Selma. Swung by Marion to visit Samford's original location which is now Marion Military Institute. By this point I had calculated what I needed to do to make it back to the baseball game in time, and it basically meant that I needed to ride as fast as possible, but the problem I ran into was that all my battery packs were dead and my Garmins were both dying. I stopped in Columbiana at Fred’s 275 miles into my ride to buy a cheap wall charger and spend a few minutes with my Garmins plugged into the wall. As you can tell by the picture below, though, I was still able to make it to see my son do a great job playing catcher! Baseball game tonight, hurried back to catch the second half of it. Josiah has been doing great at catcher.